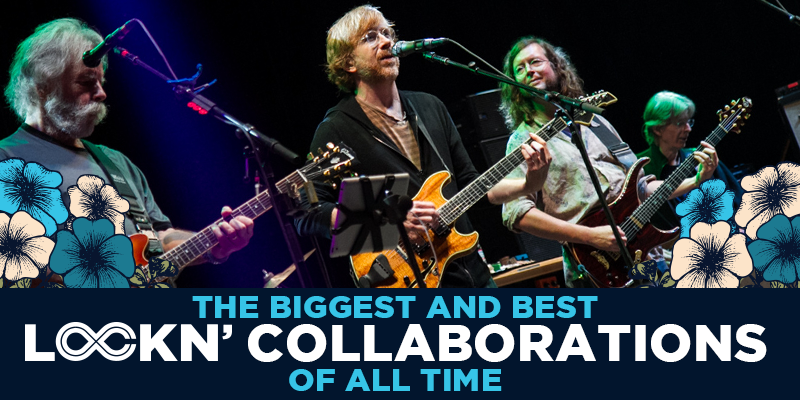 There’s nothing like watching our favorite artists team up with each other at LOCKN’! Everyone has their own collaboration dreams, and we’re proud to say that many of ours have come true on the farm. Have yours? Check out some of our favorite musical partnerships from the past 6 years and get ready for our announce of what’s to come for 2019. When we put Furthur together with Trey Anastasio in 2013, we couldn’t help but only expect greatness. And they unquestionably achieved that. It was a flawless combination that will go down in LOCKN’ history! Widespread Panic and John Fogerty at LOCKN’ in 2013 was a testament to the art of collaboration. The result was a fierce display of rock ‘n’ roll. The two couldn’t complement each other better. Bill Kreutzmann, Aron Magner, Oteil Burbridge, Steve Kimock, and Tom Hamilton all came together at LOCKN’ in 2014 to form Bill Kreutzmann’s Locknstep Allstars. When Keller Williams joined for “Bird Song,” everything worked beautifully and powerfully together. This pairing is an impeccable fit. It’s heaven. When The String Cheese Incident joined forces with Kool & the Gang, magic happened at LOCKN’. That’s right, collaborations are the name of our game. The vocals, the dancers, and the nostalgic tunes from Kool & the Gang brought everything to another level. We are head over heels in love with this collaboration. Once Widespread Panic enlisted the help of Steve Winwood at LOCKN’ in 2014, some of music’s greatest talents were combined. Collaborations don’t get much bigger and better than this. Where do we begin? This team of Grateful Dead veterans and young legends should be considered the platinum standard for collaborations, in our opinion. The result was a compelling ode to the Grateful Dead. Dreams are made of moments like this! The String Cheese Incident and The Doobie Brothers came together in a collaborative feast that certainly ups the ante as far as musical collaborations go. Both bands brought their A game and came ready to rock. This musical alliance provided a welcome reassurance after the infamous micro-burst of LOCKN’ 2015. When there are no words to describe how you’re feeling, the music never fails, and some of our favorite artists helped us escape in 2015 while celebrating the music of Jefferson Airplane. This 50th anniversary celebration featured Jorma Kaukonen, Jack Casady, Justin Guip, Rachael Price, Teresa Williams, Jeff Pehrson, Larry Campbell, and G.E. Smith. This Mad Dogs & Englishmen tribute was blessed with a slew of some of the music’s most celebrated artists. It was one of the most anticipated sets at LOCKN’, and featured Tedeschi Trucks Band and a lineup of special guests including Leon Russell, Dave Mason, Rita Coolidge, Chris Robinson, Doyle Bramhall II, John Bell, Alecia Chakour, and Warren Haynes, and many, many more. Jimmy Cliff is a reggae legend that has carved out a legacy in the world of music. So, when he came on stage and performed an empowering version of “I Can See Clearly Now,” with Widespread Panic, the crowd at LOCKN’ embraced the musical glory with open arms. Phil Lesh always assembles memorable lineups of musicians, especially at LOCKN’. This soulful rendition of “Althea” hits the mark with such genuine emotion, we bet you can feel it through the screen. This is yet another collaboration that’s worthy of your attention. Talk about a unique collaboration! Phil Lesh with the Infamous Stringdusters, Page McConnell, and Jon Fishman in 2016 was pretty special. Oh yeah, let’s also throw in Joe Russo for good measure. It’s not easy to improvise with that many people on stage, but in the spirit of the Grateful Dead, they did it! This song is an undeniable classic, and with the powerful vocals of Erica Falls and master harmonica player, Lee Oskar, well, it was an absolutely smokin’ version of one of the best songs of the 60s. Coming off of their “Godboner Meets Gene Ween” collaboration at Summer Camp, Umphrey’s McGee and Gene Ween knocked this Billy Joel cover out of the park. It was a fun collaboration that was like nothing we’ve ever seen before. Keller Williams’ Grateful Gospel is an integral part of LOCKN’. What’s a Sunday in Virginia without some worship through music and fellowship? We can feel this collaboration right inside our bones. Praise Preacher Keller and his Grateful Gospel! Twiddle and Keller Williams was a collaboration that simply cannot be duplicated elsewhere. There on the farm, the crowd felt safe and at home in the vibe. The music seemed to protect them! It was the best feeling in the world. The Avett Brothers and Bob Weir delivered a version of ‘I Shall Be Released” that is, in every sense of the word, beautiful. This collaboration stopped people in their tracks. It’s beyond evident that every musician on stage poured their hearts into this moment. You’ll get chills from watching the video, even if you didn’t witness it live. Although John Lennon left this earth way too soon, his legacy and songbook will outlast us all. Another fantastic collaboration from LOCKN’ – Jim James, Brandi Carlile, and Joe Russo performing “Give Peace A Chance” is as good as it gets. Joe Russo’s Almost Dead has become a mainstay at LOCKN’, and for good reason. They’ve done a fantastic job at keeping the Grateful Dead alive so it’s only right that Bob Weir joined them for a rockin’ late-night set. Joe Russo’s Almost Dead always keeps us on our toes, we can’t wait to see what they do next. LOCKN’ got a little taste of Led Zeppelin’s legendary songbook featuring Ann Wilson of (Heart) at LOCKN’ when Wilson joined Gov’t Mule on Friday night. It was clear that every musician on stage was having a great time, and the crowd was a reflection of it. This collaboration is exactly what we’re talking about! When Margo Price joined Widespread Panic to bless us with her empowering vocals it took this set to a whole new level! Price’s breathtaking performance of Janis Joplin’s “Piece of My Heart” was the cherry on top of an already overly delicious set of jams. A party-starting jam, LOCKN’ brought together two of the best artists from their respective genres for one international anthem! Legendary reggae artists Toots & The Maytals gave a stellar performance of their song “Monkey Man” accompanied by blues icon Taj Mahal. Taylor Hicks of American Idol and Jason Bonham, son of legendary Led Zeppelin drummer John Bonham, joined forces with Umphrey’s McGee for a heart-pounding performance of Led Zepplin’s, “When the Levee Breaks.” You never know who will show up at LOCKN’! Dead and Company members joined Foundation of Funk’s set at LOCKN’ for what we deemed as “Funk & Co.” This performance was one of our favorites of 2018 and proved that spontaneous collaborations are around every corner at LOCKN’!